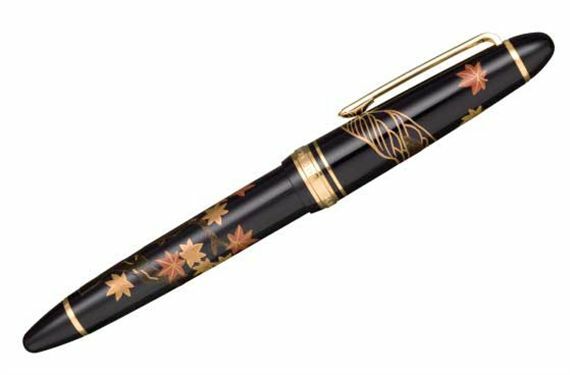 Order your Sailor 1911 Maki-e Momiji Fountain Pen today from FahrneysPens.com. Fine Pens, Refills & Luxurious Gifts – great prices & fast shipping. These Sailor 1911s feature Kaga-Maki-e, a highly respected traditional Japanese hand applied decoration process with more than 1,500 years of history.The process is regarded as the top of the Japanese decorative crafts, using precious materials such as gold, silver, enamel and abalone shell. These materials are combined and applied by hand by specialized accredited Maki-e artists with traditional Urushi lacquers to represent a variety of traditional Japanese art and culture. Extremely limited inventory available in the United States!